I've been a BzzAgent for awhile now but I haven't really found any campaign I would be happy to join in to until I saw the Covergirl promo. 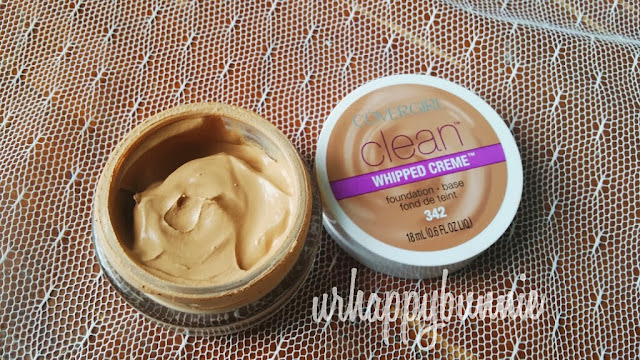 The Covergirl Clean Whipped Creme Foundation has been out for awhile now but I haven't gotten around to get it and try it for myself. 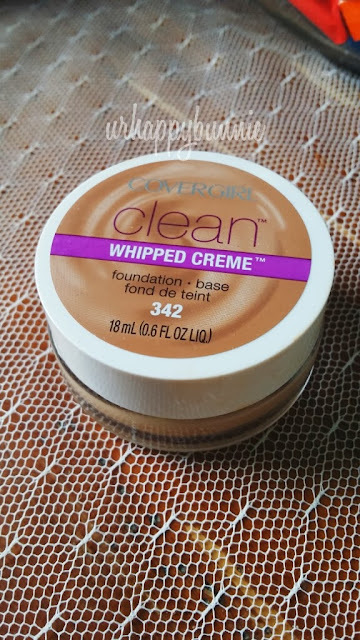 Putting it right on the table, the Covergirl Clean Whipped Creme Foundation and I have a love-hate relationship. The foundation comes in a jar and there is an ample amount of product (18mL) that will definitely last a person awhile since you only need a little bit to cover the whole face. Packaging is simple and the sticker at the bottom of the jar tells you the shade and the ingredients for the foundation. The formula for this foundation is like a mousse product but not quite - it has a slight slippery feel to it (reminds me of face primers with silicone in it) but has a powdery finish and texture. This product reminds me of the Maybelline Dream Matte Mousse Foundation except with one huge difference, this product sets about 20-30 minutes after application and there's only a slight transfer to clothes. I used to love the Maybelline Mousse Foundation but I stopped using it because it transfers a lot on my clothes especially if you bring the foundation down to your neck and you're wearing a collared shirt. I have the shade 342 in Medium Beige but upon application it looks really pale on me but it does cover all my redness and evens out my skin tone. Also, it tends to look unnatural on my face, like someone put layers of liquid foundation and powder on my face that looks quite cakey upon immediate application. And I dislike the feeling it leaves me, like a silicone face primer without layering foundation on top. Kinda confusing, but I hope you get the picture. Thus why I slightly hate this product. In terms on loving this product, well, as I said, it does set after 30 minutes or so and is slightly transfer-resistant, also, it oxidizes and after awhile it matches my skin perfectly. It still looks a bit fake on my skin after 30 minutes but leaving it for an hour and allowing it to be absorbed into my skin and mix with the oils secreted on my face they look really good and natural. It's a hassle if you want to step out of the house right away because the foundation just doesn't seem right on the face, but if you still have a lot to do after putting your makeup it is a great one. This is not a long-lasting product though. It lasts for about 4-5 hours, six max, after that my face just looks bare and patchy. I also must say that this is not a great product for people with dry skin just because the product clings on to dry patches, so exfoliating and moisturizing before application is a must. For my skin which is normal to dry, it is mattifying enough but I'm not sure how well it holds up the oil for those with really oily skin. I believe that with it's powder finish and feel it will help absorb oil and keep it to a minimum if not completely make it matte for oily skin. Overall, I think it's a pretty good foundation, but I'm not sure if I would repurchase it just because it didn't really work out properly on my skin. Other than that, Covergirl is still a great brand with lots of great product. I remember thoroughly enjoying the Lipperfection Jumbo Gloss Balms. Looks great :) Nice review! New follower + Follow back? Oh really? That's too bad. I thought it was just me and my skin type but if most didn't find it good then the brand should do something about it. Great review! does this work in oily skin too? I'd never heard of this foundation! But I do use the Maybelline mousse one and agree--it transfers, especially when my skin is in it's oily state. Thanks for letting us know about this CG foundation!